Cleveland Cavaliers fans were already uneasy about their team’s selection of rugged forward Tristan Thompson fourth overall in the 2011 draft entering this season, and by the time 2012-13’s second month rolled around the squad’s fans were even more dubious about his top-five credentials. Thompson averaged just 8.5 points per game in nearly 30 minutes a contest in November. He pulled in over eight rebounds, but shot just 43 percent from the field despite taking most of his shots in the paint. For most of the season, nearly 17%, or one in six, of Thompson's shots had been blocked. That's well above the 6.3%, or about one of 16, average for the league, according to NBA.com's statistical website, and it threatened Danny Fortson's 16.7% rejection rate in 1997-98, which is the highest for anyone who has attempted at least 500 field goals in a season since 1997, the earliest for which NBA.com has data. But after working with a former player that the Cavaliers brought in to help him get stuffed less often, Thompson appears safe from the record. Entering Monday's game, his blocked-shot rate stood at 15.3%. He's now battling Charlotte's Michael Kidd-Gilchrist, who gets 15.7% of his shots blocked, for the regular-season crown. That's still high. Before this season, only three players who attempted at least 500 field-goals in a season had blocked-shots rates above 15%. As Woo points out, Thompson has gotten steadily better as the season has progressed, something that was readily apparent to both Cavs fans, and those deigning to tune into one of their frequent blowouts. As the season nears its end, Thompson is up to 11.7 points and 9.4 rebounds per contest, while playing just over 31 minutes a night. Most importantly, he’s now shooting a respectable 49 percent from the field, thanks in large part to the help of a Cleveland Cavaliers legend who helped Tristan master a shot the legend (at 7-3) rarely had to take. Thompson almost always dunks the ball two-handed, for fear of dropping the ball if he tried it with only one hand. This means he doesn't have a free hand to shield the ball from a would-be blocker. "Even though I'm 6-9, my hands are probably a 6-4 guy's hands," he said as he wistfully stared at his fingers after practice last month. Thompson was getting rejected so often early in the season—he had 19% of his shots blocked from October to December—that the Cavaliers asked Zydrunas Ilgauskas, a 7-foot-3 former Cavaliers center who works in the team's front office, to come in to teach him how to avoid being blocked. Thompson said having to shoot over someone that big has helped. This isn’t what you’re used to seeing from NBA big men in the modern era. Usually those with holes in their game fall back onto orthodox strengths, either utilizing a post-up game most of the time, clearing space for face-up jumpers from the perimeter, or attempting to bang their way to the free throw line every time. Because Thompson, in the early stages of his career, isn’t adept at such maneuvers he has to rely on that floater. And if he can learn how to release it while he’s still trending toward the arc of his jump, this will prove to be an almost unblockable shot for defenders, who are so used to having to thwart attempts that are released at the highest point of a opposing players’ jump. 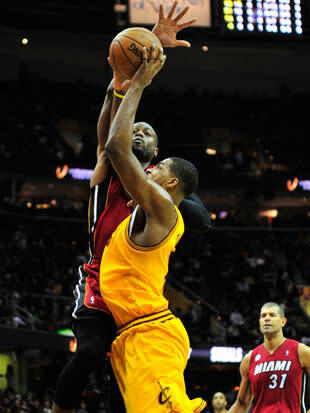 A shot like that wouldn’t be unlike Antawn Jamison’s floater. Jamison is a player that Cavalier fans recoil upon hearing the name of, but he's also one who spent the entirety of George W. Bush’s two terms in office seeing his shot blocked about as many times as George W. Bush gave open press conferences. For a while now, including that push shot and the way he has to gather himself to go up for the two-hand stuff, Thompson’s eye-test reminded me of middling former Chicago Bulls power forward Jason Caffey. I liked Caffey, he had hops and quickness but his short arms and relatively short stature (for a power forward) got in the way of much progress. Thompson is already far better than Caffey ever was, though, at a much younger age. And even if he still has plenty of work to do as the feet-movin’ rebounder the Cavs hope he may develop into, Tristan is already well on his way offensively. And he’s perhaps one flat-footed Otis Thorpe-type jumper away from putting it all together on that end, and not having to rely on those small’ish hands to grip and gather for a two-handed dunk that everyone sees coming … over 15 percent of the time. Thompson was drafted to act as a defensive bulwark, and that sort of status takes time and reps to build upon. It's a credit to the Cavaliers that they've let Tristan develop in full view of the cameras, and an even stronger credit to Thompson that he's kept his head up (and arc high) despite some early struggles. Draft class be damned, this guy is a keeper. "I got a girlfriend," said Thompson, who added that he asked her out only once. "Most women are interested in me, because I have dimples and I'm Canadian." First dibs on “Dimpled and Canadian” as a band name.